A father and son? (with a faithful spaniel). There is certainly a family resemblence between these two gentlemen - in hairline, build and facial hair. 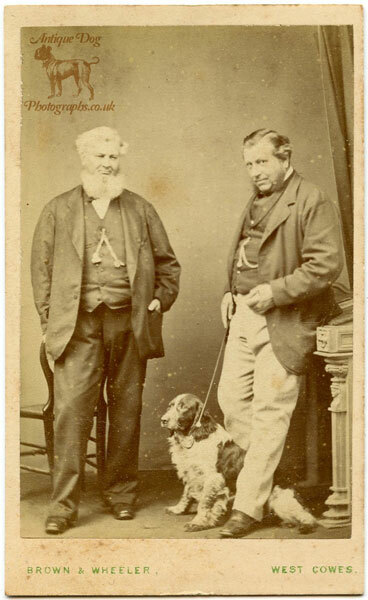 This photograph was taken at the Studio of John Brown and John George Wheeler at Wilton House, High Street, West Cowes, Isle of Wight. As well as their photographic work the pair painted miniatures and local views, an example of which can be seen here. Brown and Wheeler were working together at Wilton House from 1867 to approximately 1875, so we can date this photograph to this time frame. The simple photograph mount and thin cardstock would put this photograph in the earlier part of these dates. Born in Camberwell John worked as a Teacher at a private school before becoming a photographer, as you can see below in the 1861 Census. John had 5 children, 3 of which were born in Winchester between c1853-1858. It appears that the family moved to the island in c1859. Census Returns of England and Wales, 1881. Kew, Surrey, England: The National Archives of the UK (TNA): Public Record Office (PRO), 1881. They do look like father and son, they are even wearing similar vests, jackets and watch chains. On a separate note I am very interested in your copyright emblem that you place on each photo with the dog in the middle. Are you willing to share how you do that?